With a melodramatic sigh, I grumble quietly at the pile of work on my desk. It’s pitch-black outside my window, but the sky is hazy and as always the stars are nowhere to be seen. Whether in 2011, when I was a freshman daydreaming about the person I was going to be in high school, or now, when I’m a senior daydreaming about the person I’ll be in college, I never get much sleep: hopeless exhaustion is one of the two consistent parts of my entire high school life. The other string binding this chapter of my life is Farewell Fighter. The Nashville pop-rock band released its breakout EP The Way We Learn in 2011, around the same time I was rushing to finish five book reports before my first day of school. If you’re a music fan, you have that special one release, the one that arrived exactly when you needed it, and The Way We Learn was a voice of both sympathy and wisdom, not to mention the album that got me through countless unbearable study halls, lonely bus rides home, and yes, sleepless nights. Now, while I do everything in my power to avoid thinking about college applications, the band is back, and let’s not mince words: Challenges is the best pop-rock album of the year (if technically only half the best pop-rock album of the year—more on that soon), the one I want to recommend to everybody without hesitation and the one I’ll sing along to as this stage of my life reaches its end. The biggest point of contention for many long-time fans will no doubt be that we’ve heard half of Challenges already: six of the album’s twelve tracks are taken from The Way We Learn. The difference is noticeable as well, as the new tracks utilize a slightly more lush instrumental arrangement and showcase evolved songwriting and production compared to the older tracks. But instead of merely recycling, Challenges redefines, using the divide to explore self-growth in the midst of youth, a crucial part of understanding the album. Intentionally or otherwise, the two halves of Challenges are really two perspectives engaged in a continuous dialogue. Call ‘em Farewell Freshman and Farewell Future, if you must. Let’s begin with Farewell Freshman. What struck me about The Way We Learn when I first heard it on a crowded subway train in the winter of 2011 was how dead-on its portrayal of aimless youth was, and the songs from that album hit just as hard on Challenges as they were two years ago. The thoughts opening “Well Wishing,” where lead vocalist Kenny Fleetwood proclaims that “for now [he’ll] take anything,” feel just as relevant to my future college woes as they did to my freshman year existential crisis. Then there’s “Growing Pains,” whose ferocious chorus nails the sinking feeling in your gut when you realize maybe you were the problem all along; “Love, Lust, And Losing It,” which any prom-bound teenager should immediately latch onto (not just because it’s wonderfully honest but because it’s perfect for dancing to); and “Never Have I Ever,” where the band offers a searing satire of the dire American economy. Fine, the last one’s a stretch. Fleetwood actually just lists off a bunch of ridiculously impractical day jobs and dismisses all of them because like all of us, he spent his summer vacation marathoning How I Met Your Mother instead of getting any actual work done. Sure, some will scoff at these topics as they Google the First World Problems meme, and yeah, there’s a target demo the band’s catering to, but when I look at my mother in the corner of the room as she wipes the sweat from her brow, I feel like the song blasting through my eardrums could have been written for her. There’s a reason so many films, TV shows, and albums focus on the perils of adolescence: for a lot of us, they never stop. And instead of getting all of the old material out of the way at the beginning, the band makes it a point to sprinkle it throughout the entire album. Here’s half the challenge of Challenges: growing up isn’t something you finish and score a diploma for but a process you continue for your entire life. If the album's content is a direct import, the context more than justifies its use. On the other hand, the band engages itself more actively than ever on the other half of Challenges. The new material is equal parts jaded and wise, delving into darker thoughts in far more detail but reaching mature resolutions rarely seen on The Way We Learn. In terms of sound, the overall balance of the band hasn't shifted much. You'll see some softer keys here (most notably on “Grow”) or some strings there (which bring a plucky, vibrant energy to the grim conceit of late-album standout “Epitaph”), but the biggest shift is textural. Farewell Fighter has tinkered with its dynamics a bit, straying from limited piano-forte binaries, while the scrappier edges of the production have been refined for maximum effect. “Bridges” is the grittiest the band has ever sounded, but it also hits brief pockets of clarity that ground the storm. The lyrics evoke a similar sense of enlightenment as well: “I’m ready to burn these bridges for a better way,” Fleetwood declares on the song’s searing chorus. “I guess I just wasn’t carved out to fit in!” he howls later on, with a detention hall’s worth of gang vocals to back up his newfound moment of truth. 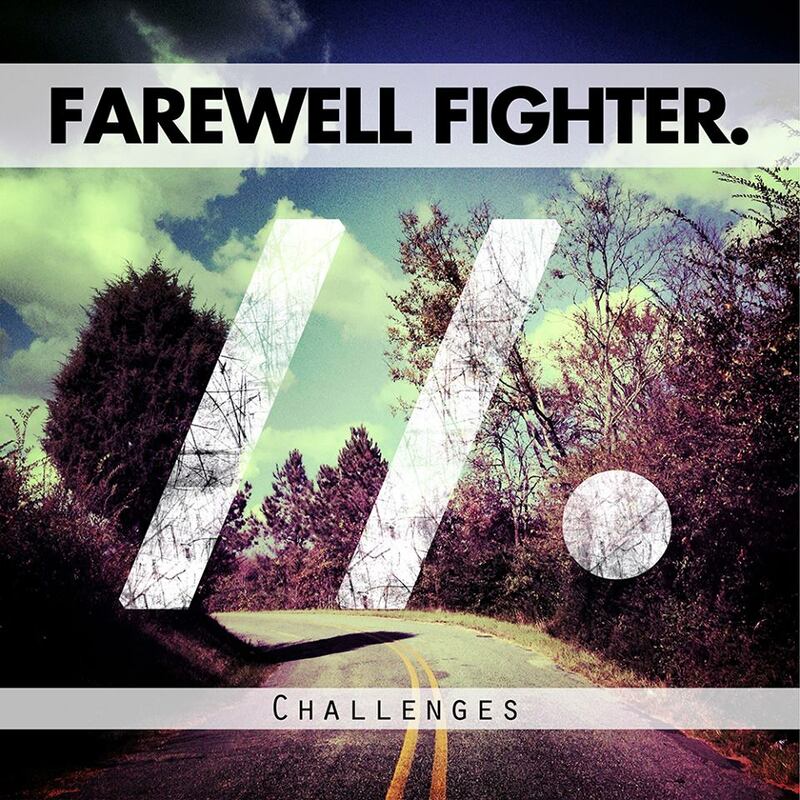 It’s a real treat to see just how confident Farewell Fighter has gotten in the two years leading up to Challenges, as each of the new songs reaches thematic poignancy through sophisticated instrumentation and structure. Gone are the days when everything was banked on one kickass chorus (though to be fair, the band still pulls that trick off damn well). “Fall” reverses the connotations of its titular theme by making it sound blissful: the verses brim with restless energy—and the band drops its first naughty word, always a fun landmark—but the chorus slows down enough for you to hear the church bell melodies in the distance hinting at the better days just ahead. “Remember last time, you’ll be alright,” Fleetwood sings, handling failure through the lens of perseverance. “The Bend” is an amiable ballad, laced with just enough weight around the edges (sadsack gang vocals, pounding ocean drums) to skirt sappiness and make its idealistic sentiments sound almost practical; my favorite track, however, is “Epitaph,” an understated surf-rock gem that walks the line between despair and delight better than anything on Challenges. Even as the lyrics mourn the emptiness of our day-to-day lives and the destructive cycles of desire we get stuck in, the swirls of violin and shimmering key melodies pack the music with a disturbingly pleasant feeling of disorientation. “We’re running in a circle in a race we can’t win,” Fleetwood realizes in this happy haze, stuck in his comfort zone but too dizzy to find his way out. It’s a remarkably complex story packed into a remarkably catchy tune, a standard the band nails twelve out of twelve times. 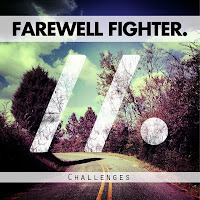 As nuanced as it is, listening to Challenges isn’t challenging at all—and in its simplicity the band approaches transcendence: regardless of how you feel about the genre, the scene, or the sound of this album, there is a raw beauty in how Farewell Fighter burrows its way into intimate memories to crack them open for everybody. Either these were your stories once, or they’re your stories now, and if you haven’t felt them yet, maybe they’ll be your stories someday. And isn’t that what a really magnificent work of art does? Make you feel, if only for the space of one song, that you are okay, that you are understood, that you belong somewhere in the fabric of this world? If you look down, you can see the footprints thousands have left before you were here in this position. You’re not alone. With this in mind, it’s fitting to me that this album opens with one voice but ends with a chorus. “Golden” is a fitting way to end the album, a winding firecracker of a song that carries us through all of the little things we pick up on our journey towards adulthood. The first half’s all about looking inwards, thinking about everything that makes us who we are. I’ve learned in hard times, breathing is the best thing I can do. I’ve learned letting go is harder than it looks. And I think I’ve learned to filter out the voices in my head—but I’m still not sure. I may never be. But maybe that's okay. It’s 3:48 AM and I’m wrapping this up when the music slowly dies down to nothing but a guitar and Fleetwood’s vocal, completely stripped; “We are golden because we’re alive,” he sings and all of a sudden it sounds like he’s straining to reach you from where he stands six thousand miles away, connected by nothing but the earphones in your head. And then, without warning, the song roars to life, a chorus of voices rising to become one as it brings Challenges to its stirring climax. It’s still pitch-black outside my window, but if I squint hard enough, I think I can see a white dot, the first star I've seen in years. Against my own will, I feel a smile creeping onto my face.